Using a folding 90 and 45 degree set square I begin setting out the blockwork, this entire project will run 90 degrees and parallel from the property, a member of the team holds one end of a string line flush with the orange face of the set square and I unwind the line at the far end of the landscape feature block wall. I take into account the neighbours leaning 100mm wall and with a 6ft spirit level I mark the footing plumb with the top of the lean, then add 10mm. 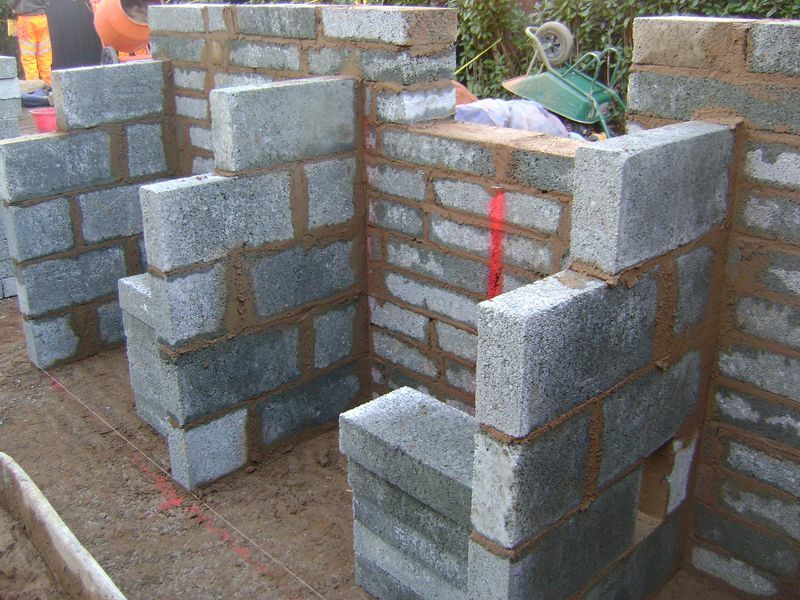 Knowing my blockwork walling is 225mm wide I remark the footing to accommodate the width of the wall making sure the new wall is built clear of the neighbours leaning wall. Once I’m content two nails are inserted into the concrete at either end of the string line and a marker spray is used to spray the nails. The outdoor kitchen bbq area block walling will be constructed along the same line as the black recycled decking, knowing that the Saige composite decking walk way is 1.6m wide two road pins are used, the first pin is inserted into the sub base at 1.6m from the property and a string line attached to the pin, the second pin is inserted at 1.6m from the face of the property and the string line is pulled taught whilst I’m at the far end of the exterior kitchen wall area, once the string line just touches the second pin I insert a nail into the concrete footing and spray with marker spray. I double check all measurements before moving to the next stage. 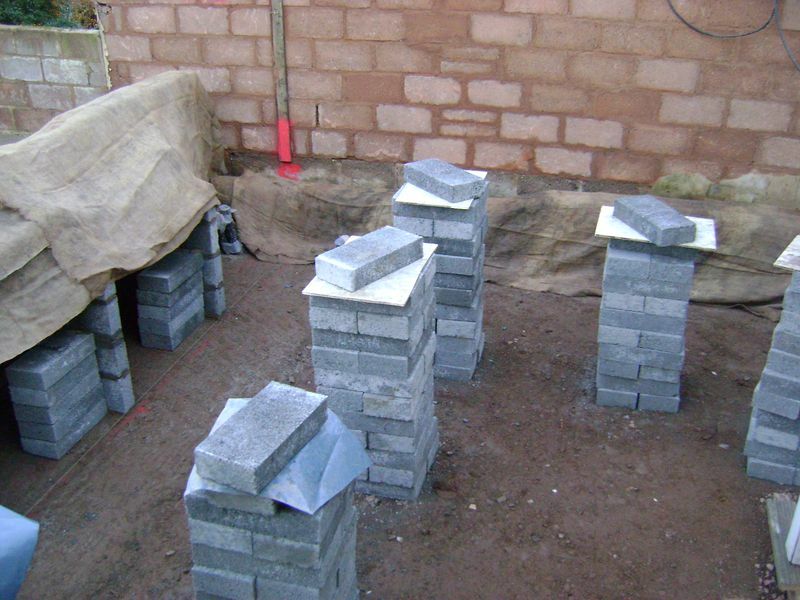 The 4;1 ratio brick mix with Febmix included is barrowed into position. 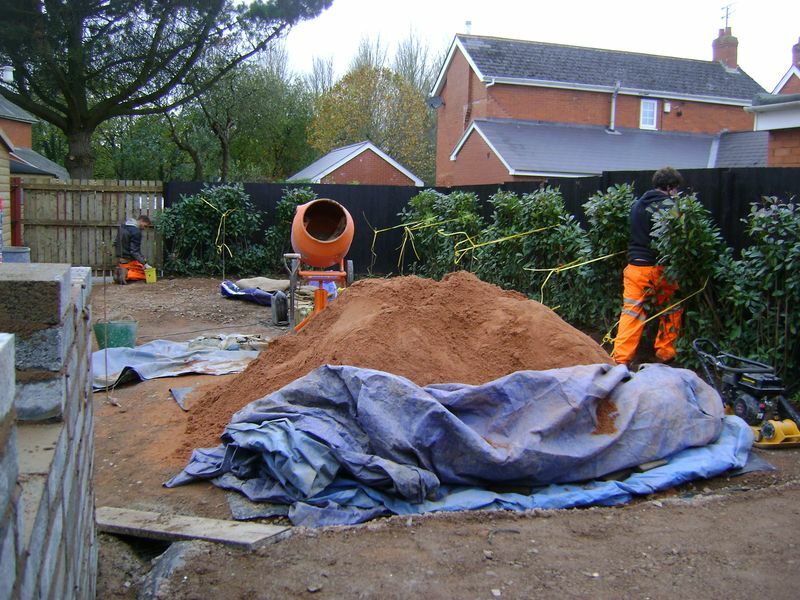 Another member of the team loads out the blocks from the front garden and brings the remaining sand to the rear garden, my landing platform soon becomes clear for the next delivery. 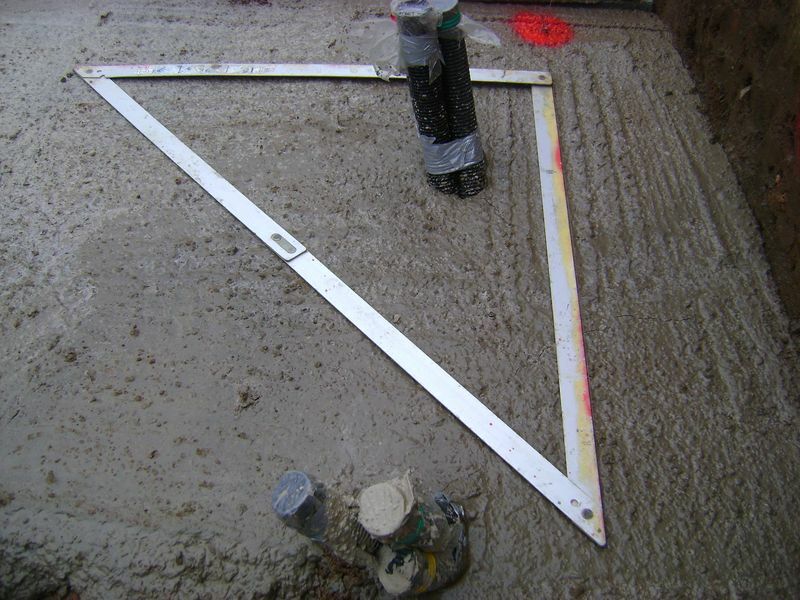 With all the measurements double checked I install the first course of 225mm wide concrete blockwork. 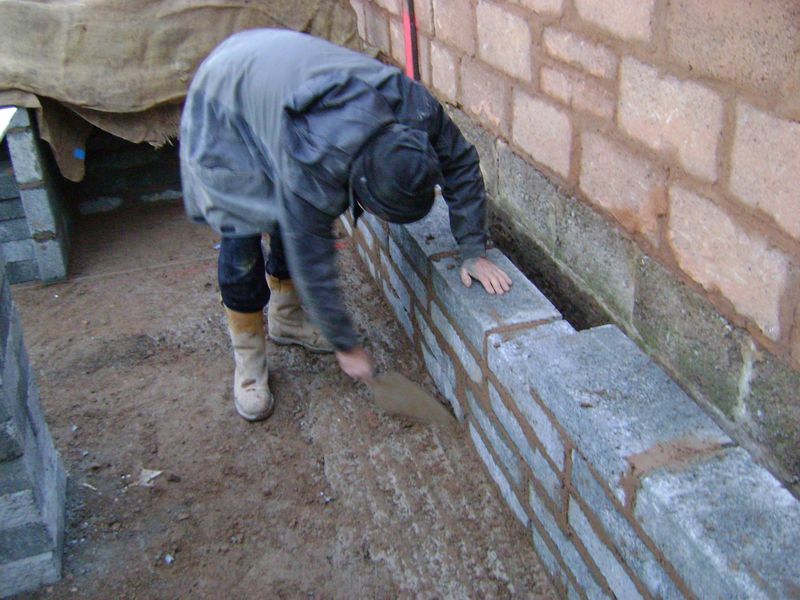 No weep holes are required as this walling is not a retaining wall and no materials will be placed against it, its purely a feature wall. 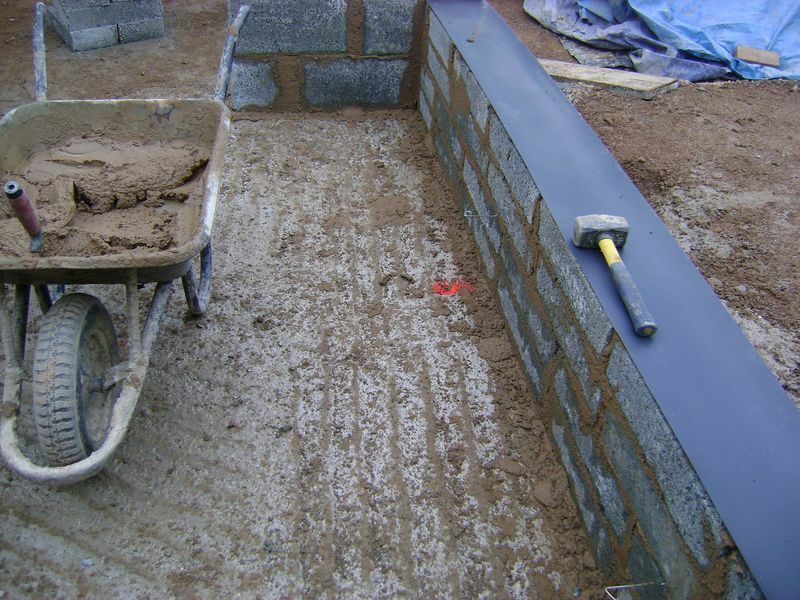 225mm wide DPC, damp-proof course, this flexible plastic sheet is a barrier in all garden landscaping walls and is designed to resist moisture rising through the structure. 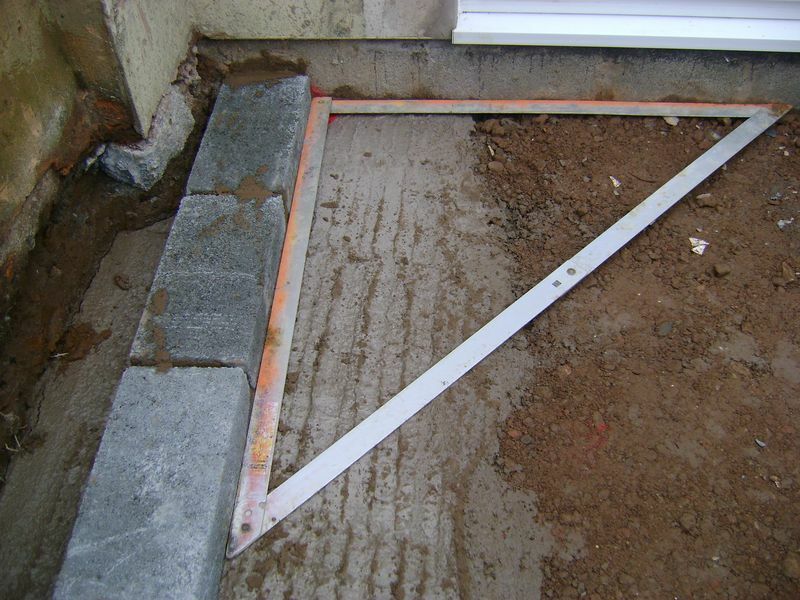 This DPC course may seem high, just remember that the composite decking main frame and deck-boards are not installed as yet. Block works can not continue on the outdoor kitchen as I’m ready for lintels to be installed, I’ll collect the concrete lintels in the morning, the client has requested two work change orders on this particular piece of work, an additional door and below storage space with shelving and the insertion of a wireless Bang and Olufsen speaker facing towards the raised seating area. Not a problem sir…. I’m just happy that we haven’t got to dismantle to meet your requests. Using road pins and the banding from the concrete blocks the team ease the Photinia red robins from the fence giving enough access to repaint the second coat of Cuprinol black timbercare on the fence, the first coat was applied by the client, or his wife. Having monitored the South west, Devon weather for this week I know the next cold day will be this coming Friday, unfortunately, I tend not to believe all that I read so I’m covering the feature wall in three layers of Hessian to act as a thermal jacket. The entire site is cleaned, as are the tools, I wont repeat my self again with cleaning and my tools as I’m sure you catch my drift. 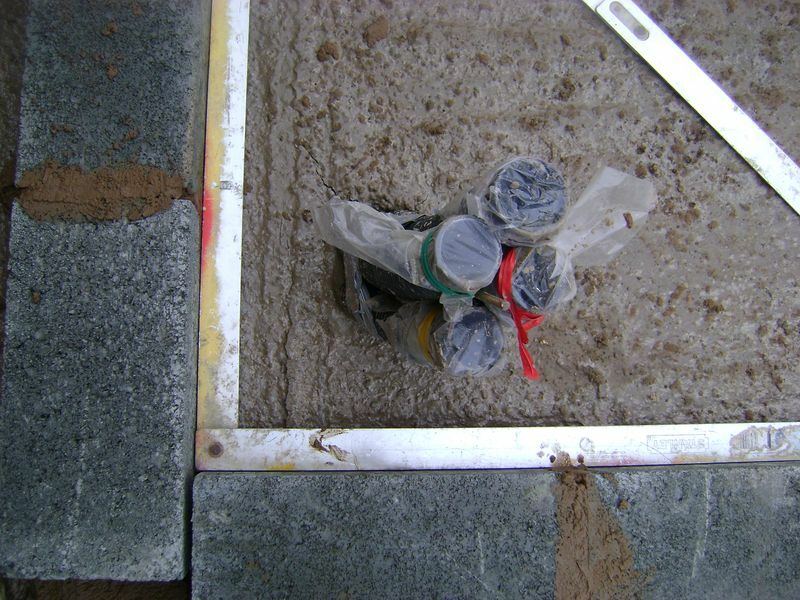 All mortar snots are cleared away making life easier later when it comes to the rendering stage.